Here the letters are beginning to return ... how we need our entire alphabet in order to communicate more than mere incoherent grunts! Nada by the way, means "nothing" in Portuguese. The intimate and delicate performance was like a dialogue between the dancer and the musician /guitar player, as if they were talking with each other about secrets only they knew about. But we understood them anyway. The dancer was Simone Marcal (the "c" pronounced as "s") and the guitarist Josue Nunes. The choreography and stageing was by Tela Leao. I found it enthralling. The solo dancer took us through the centuries of Brazilian dance, changing costume on the stage, never losing our attention, occasionally calling out some words in Portuguese, holding a mimed dialogue with Josue the guitarist, who sat at the side of the stage performing with virtuosic skill, while Simone made breathtaking leaps, somersaults and thoughtful glissades, from time to time approaching the very edge of the stage and communicating with us the audience using her most expressive face! This etude has a melodic line that sounds like the ritual dances of the Brazilian Indians during the Quarup ceremony honouring the dead. With this music we evoke and pay tribute to our own dead. The choreography ends with a reference to the first steps of The Rite of Spring by Igor Stravinsky, choreographed by Nijinsky, which opened in 1913, the same year that Villa-Lobos's compositions were published. The dancing reminded me a little of my former tenant, the dancer Eilit Marom, now teaching in Haifa, I believe; she developed her special style of movement, combining lithe gymnastic-like use of the body, built upon what is clearly a structure of classical ballet steps. A joy to watch. Having spent several years (pre-teens) enthralled by ballet and a devotee of the English magazine Dance and Dancers, I still find it entrancing to watch dance that has developed out of classical ballet, adding other less rigid movement and sometimes voice, yet retaining the discipline of the plies and the petits-battements... (sorry about the missing accents...). So here we are in a quiet corner of the Algarve, the pounding sea across the street, watching and listening to a performance that transported us to the far forests of Brazil, another culture and a new language of rhythm and movement . It is a long time since I've done that! We arrived here last September. Delighted with our decision to overwinter in the Algarve: the countryside is more beautiful than I had realized. (This is where I should fly over a few pix, showing the rolling vine slopes, the rugged rocky cliffs, the ancient hilltop cities -- some dating back to pre-Roman times, and the endless fields filled with olive trees or covered with the cork oaks for which Portugal is famous). But first words, then pix! As soon as we crossed the river Guadiana that forms the boundary between Spain and Portugal, running south into the Atlantic (west of Gibraltar), we noticed the difference. Well, of course, the language: we really thought we were hearing Russian until our ears grew acclimatized! I am used to languages where much is swallowed (think of English!) and where the final syllable is dropped. But Portuguese really excels. I hastily looked up a Centro de Linguas within walking distance of our boat ,and enrolled for ten private lessons, which cost two (people) for the price of one! So David came along too. We had an excellent teacher who soon picked up our love for words, though she couldn't always answer our questions. But her pronunciation was beautiful and still, several months later, in my head I hear her clear diction: moeite bom! Just before we left in December I enrolled for a follow-up course, more intensive, 15 lessons of two hours ... looking forward to this: starting on Monday. The weather now is a joy... clear skies and sunshine, occasionally a soft wind, rocking the boat gently, the ropes creaking as they pull. Sounds that rustle through the background and play through my dreams. How quickly one adjusts to climate change and cramped space: I think I have far too many clothes and shoes on this boat, but of course with somewhat variable weather conditions one does need to be prepared. As soon as I feel my elbows are becoming squashed, I hop off onto the wobbly pontoon and plod cormorant-like to where the ground is steady! I will also try to fly over a pic of the cormorants, our determined neighbours, who dry their shining wings at the end of our pontoon, diving from time to time into the grey waters, and returning with a fat fish. fragments of poems, dialogues, songs... 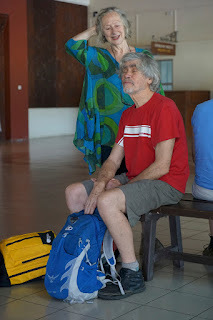 The pic is of David and me in trekking gear: I just love the expression on David's face... I suspect he was feeling sleepy! The pic was actually taken in Malaysia, waiting at a small airport before returning to Brunei. 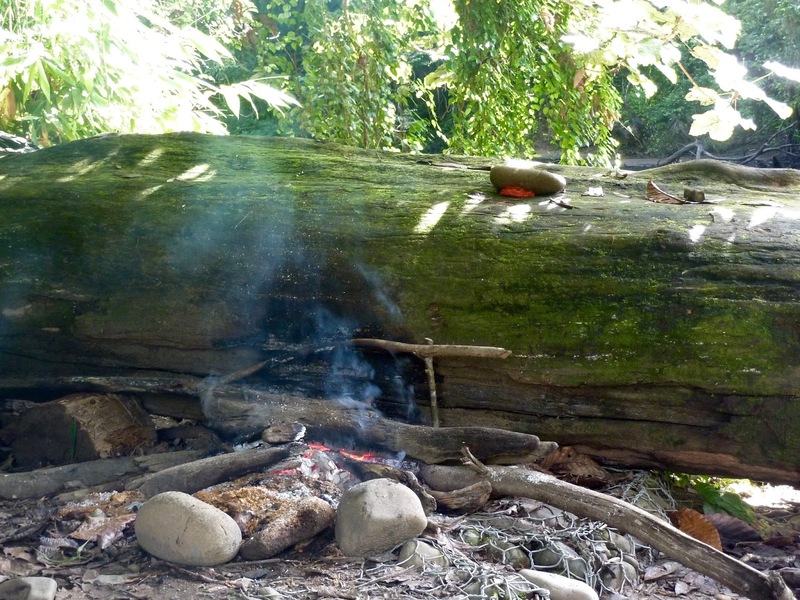 Here is an illegal fire in the jungle: we don't know who lit it, or why. Our guide regarded it sternly and remarked sadly how many people (especially those from cities) do not know how to respect Nature. He had grown up in Temburong and learnt about the jungle from his father. He knew an astonishing amount about the plants, the trees, the ways of the water, and the geology of the area. 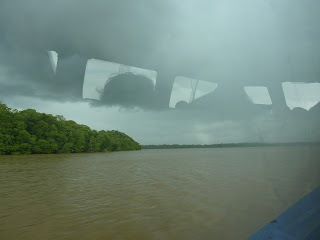 The second picture is one I took as we returned down the river Temburong, back to Bandar Seri Begawan. As we zoomed onward the sky darkened and the clouds burst, pouring down a fierce deluge, accompanied by rumbles of thunder. Terrific. I managed to make a video of part of this. Might even manage to transport that from my photo collection to FB. Life really is a question of continual learning! Writing now in Amsterdam where spring is appearing after a weekend of wondrous snow (crunching through whiteness, snowballs and sledges for the kiddies, even a snowman with a carrot for a nose). I did manage to fly the snowman pic onto my FB for those who are interested! Still need to practise some photo-flying techniques in order to lighten my pages of pulsating prose ... (ah how I love a little alliteration). A strange feeling, leaving a place with the almost certain knowledge that you'll never be there again. It's definitely the rainy season, we awoke in the dark to downpour and saw the children off to school splashing through warm puddles before getting into the car. Who cares if you get soaked, it soon dries, and it's as enjoyable as a warm shower. The stillness hangs over the house; I pack the large suitcase into which David and I fit everything we've needed during this month. I will miss the quality of silence here; the trees hug the air inside their densely-matted spaces and do not speak. I only walked along careful paths carved for me so I could briefly turn my back on paved roads and systems of civilization. I understand now why people quit the built constructions we call towns and cities. But ambivalence remains: I do love Mozart and sushi! The rain has stopped and through the dense green come sounds of twittering birds and chirping of crickets. Sometimes we have been visited by a few monkeys, delicately treading along the top of the back fence. They gather behind the stores nearby, scrounging leftovers from the little cafes (Starbucks and other multi-nationals). Speaking of which, now for our final expedition down the hill to the little supermarket and handy local stores (run mainly by Chinese Malays). Do you remember those small books published in the UK fifty or so years ago, part of a series titled In Praise of... and then something like Music, or Gardens, or Shakespeare? I was reminded of that as I pondered what to write about Borneo. Yes, In Praise of the Jungle. What do I find most striking about this phenomenon? First, the immense silence, then the endless green, then the incessant undersound of unseen creatures: birds, crickets, frogs chirping and insects buzzing, rustling of snakes and small creatures in the dense undergrowth. And often hidden streaming water from the many rivulets or waterfalls. But stand still, and you are overwhelmed by a ground bass of deep silence. Curious. Enormously restful. We went for long walks (usually accompanied by a most knowledgeable guide) climbing into the caves (at Mulu) or along the slippery wooden board walks created for the urban explorers who wanted to rediscover a world their ancestors might have known. In Temburong we canoed down the curving river, rushing over shallows where the white waves stood like tiny hillocks, and zooming around bends sometimes under the low hanging branches of the huge trees that throng the banks. This is what we're going back to tomorrow: that's my back garden in snowy Amsterdam! Well, not sure about the snow right now but certainly cold-ish. Such a contrast to here where the heat makes me need a shower every day (though I don't indulge). I have put a selection of fine pix taken in Borneo on my FB page, but have decided for the time being to eschew all written comments on FB, awaiting a better global climate! Meanwhile here I shall blog about the beauties of the world (!) and try to record little stories about the things I see and think about from day to day. Well, it's going to be a big leap tomorrow, from a place here where the warm air caresses the bare skin, to a country where one requires scarf and gloves and woollen-lined boots. But I'm looking forward to seeing friends and neighbours and all that the Netherlands has to offer of a cultural nature (music, films, museums ...). Tomorrow the flight in the late afternoon, in three stages: BSB to KL, then after a four-hour wait, KL to Dubai, then Dubai to Amsterdam. And the photo at the beginning of this blog shows me steering Stroemhella through the Straits of Messina, which is one of my finest memories! Just returned from the most amazing and unforgettable day: sorry abut the cliches, but it really was! The wooden steps of the upward-leading stairs were very wet and slippery, so movement went at a slow pace. Some of our fellow adventurers gave up before reaching the top. I must say, although David and I are fairly fit for our ages (77 and 73) we had to pause for puffs from time to time. But we made it. Took some fine photos which I shall attempt to publish. But now weariness overcomes me, so the write-up will have to be postponed. Tomorrow is our final day here, and I would not be surprised if this is the last time we visit Brunei. It is a long journey from Europe and the climate does not entice me. However, the landscape is truly stunning and the culture (like all cultures!) is fascinating and I have loved being here. Terimah kasih all our Malaysian and Bruneian friends. These pictures are of the Water Village at Bandar Seri Begawan. Seen from the river Brunei, as we proceeded towards Temburong. That's a proboscis monkey... and the birds are egrets. Friday evening, 3 February, sitting in the house in Bandar Seri Begawan after supper, the children now getting ready for bed, all quiet and dark outside, save for the occasional hoot of a night bird. Now I hear the frogs croaking outside and the gentle patter of the friendly geckos as the scamper up the walls. Inside or out. I guess soon there will be the customary evening downpour, splendid luscious drops of rain pounding down onto the shingle roofs and concrete of the front yard. We have been here almost a month now; soon back to that other world in Europe. Every day has been full (I feel like misquoting: I have measured out my days in streams of sweat, not coffee-spoons). Didn't get very far speaking Malay (though could recognize some expressions because of familiarity with Indonesian) but managed to produce Terimah Kasih (Thank you) at appropriate moments. Tomorrow the last jungle adventure is planned, into Temburong. Untouched and uncorrupted, this area of Brunei boasts the best example of primary rainforest in the world (so the guidebook tells me). So equipped with camera and a quantity of dried apricots, rucksacks packed, we set the alarm on our smartphone for six a.m.
David is working on his laptop doing calculations of an intricate mathematical nature, in his attempt to establish the ultimate number of Magic Squares it is possible to create, or something in that realm but I'm afraid I cannot exactly grasp it; but I so see the sheer beauty of pages of neat symbols, equations in a language I do not comprehend but admire (somewhat like my reaction to Arabic script: beautiful and how I wish I could understand it). I am never quite sure if this work is really making him happy (he's been at it for years, writing, scrapping, re-writing, cursing, undoing, gleefully uttering noises of triumph, then once more undoing, deleting ... and so it goes on. He has the notion that having once begun he needs must finish. Well, OK, I respect that! Now we are off to celebrate Chinese New Year here in Bandar Seri Begawan with Malaysian Chinese Christians. Life is nothing if traditions are not maintained!